A language can be both a limitation and a means of connection. In the context of mobile apps, localization can help you access global markets, increasing downloads and return on investment. Mobile app localization allows an app to support multiple languages. The default one for most applications is English, and as a rule apps are developed with an English UI. In fact, according to research by Distomo, apps experience an average 128% growth in downloads shortly after adding localization. If you’re interested in designing a multilingual application, this article is for you. We’ll explain how to make a multilingual mobile app for ios. You’ll encounter the first option more often. With this option, the app requests the system language at launch and if it’s supported, it is displayed automatically. If the system language isn’t supported, the app displays its default one. The key here is that changing the language must be done in the device’s settings. The second option is less common, however it is also widespread. With this option, the system language is either requested from the server or from the system. With the second option, when the app is first installed it still requests the system language from either the server or the device and installs it, if supported. After that, however, the user can change it however they like within the app, and this change won’t affect any other part of the system. When setting the language from device settings, you can use both storyboards along with pure code. The last point needs some explanation. When the localization file for storyboards is generated, each element containing text gets its own key that contains the text. If an element is deleted or altered, however, the key will still be there. This means that after you change something in the text, you need to regenerate the file for each language. Otherwise, the app won’t be able to translate the element with a phrase or label without a key . So the main problem with using storyboards is that after you regenerate the storyboard localization file, you need to replace the translated text once again because the previous translation will disappear. There’s a way out, however – you can manually add an ID for each element that contains text. 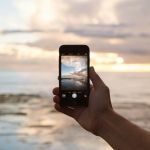 Setting the language directly in the app involves only code, however, because you can’t change the language inside the app dynamically – you’ll need to either restart or substitute rootViewController. 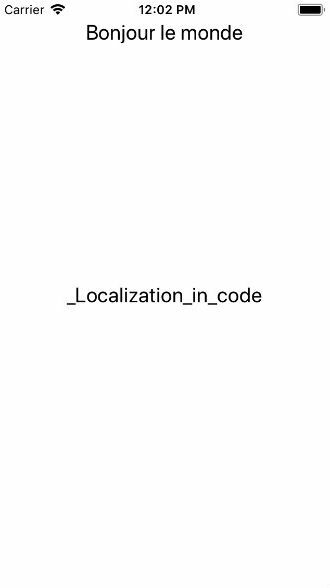 However, there are also downsides of implementing localization in code only. When you work with files with Localizable.strings, there’s plenty of chances to make a mistake. Moreover, you won’t be able to notice mistakes until you begin testing. If you lose a single symbol like “=” or “;” (for instance, in “HELLO_WORLD” = “Hello world”;), during compilation your project won’t work. To make things worse, XCode won’t show you the exact place where you slipped up, so you’ll need to find it yourself or search for popular phrases. 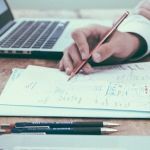 It’s up to you to decide how to implement localization, but be sure not to use too many storyboards and be aware of mistakes you can easily make in your code. 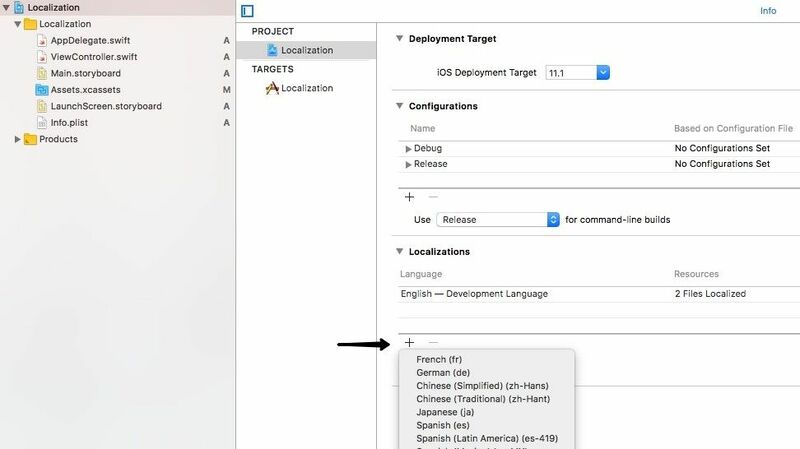 Now let’s look at how to implement localization in the two cases we’ve mentioned: when the language is selected in device settings and when it’s selected in the app. Go to the main project file and choose PROJECT. There you’ll see the main language, which you can change if you need to. Press + to see a list of available languages and choose the one you want. The next screen contains a list of storyboards that are present in your app. Leave all of them as selected and press Next. You’ll see that the language list has been updated and the one you’ve selected appears in the list. 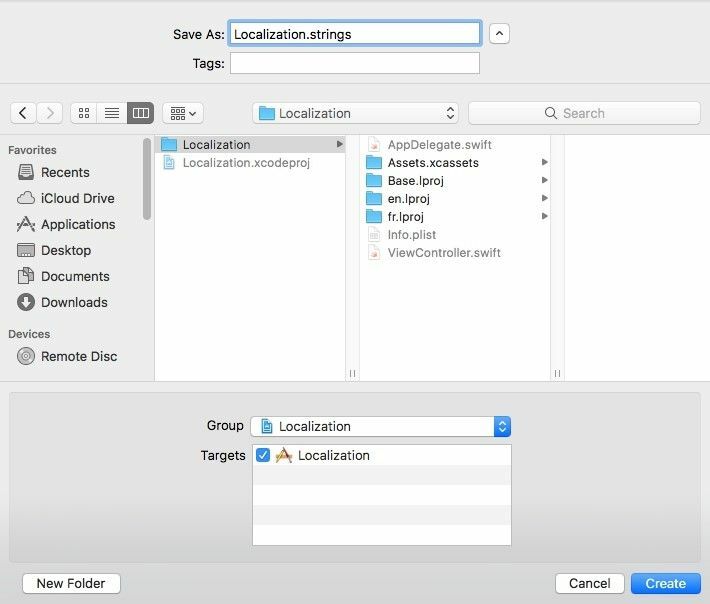 Now you’ll be able to find the Localization.strings files that were generated by XCode. You’ll use them to translate your application. The file for the language we selected is now generated, but you’ll notice that it’s absent in the list. XCode excludes it because now it’s a default one. Each time the app is launched, it will take the text from the storyboard and not from the localization file. However, if you want to send files to the translator or manager, you should generate the localization file manually. To do this, select the storyboard you want and go to Interface Builder –> Identity –> Type. Check English and you’ll notice English in your list of storyboards. At this point it’s time to send the file with text to the translator. Don’t forget to tell them about the _Localization_in_code key, which they should ignore – it will be translated in code, and for this translation you’ll need a separate document. After you get the translated document back, update your file. Now it’s time for testing. If you’re testing on a device, change the language there. If you’re using a simulator, go to Edit Scheme –> Application language and select the language you want to test. After you press Done, the app should launch in it. 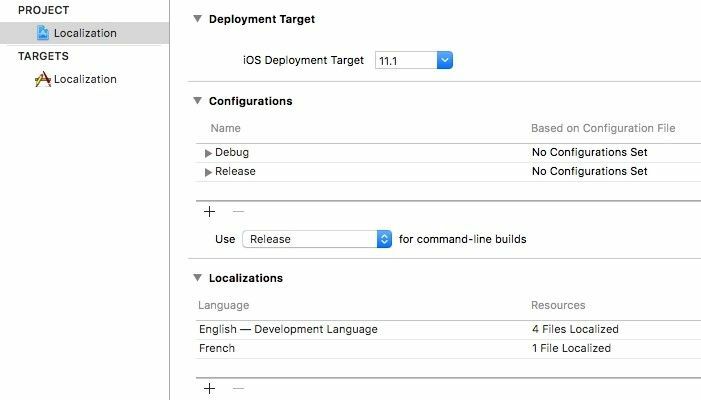 To perform translation in code, XCode doesn’t generate the Localization.string file automatically. You’ll need to do it yourself. 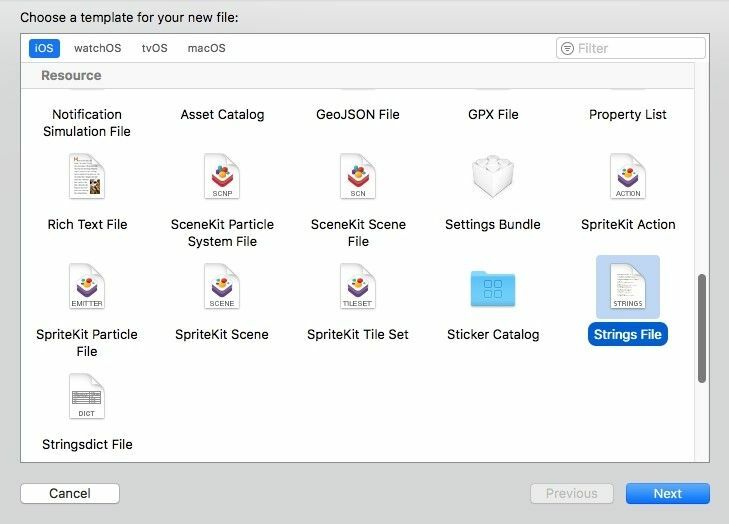 Go to File –> New –> File, choose Strings File and press Next. The next step is to assign the name Localizable.strings to the String File and indicate a way to the project. Press Create. 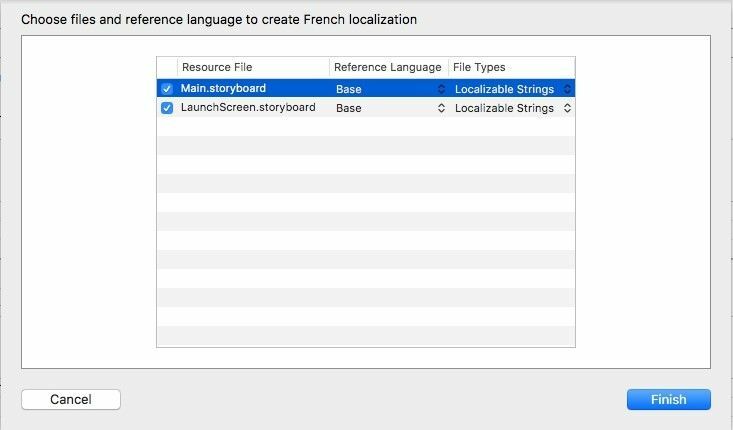 After you’ve created the Localization.string file, you need to add the languages you added to your storyboards into the Localization.string file. Go to the Interface Builder in a storyboard that needs translation and tap Localize. Select your languages just as you already did for storyboards. 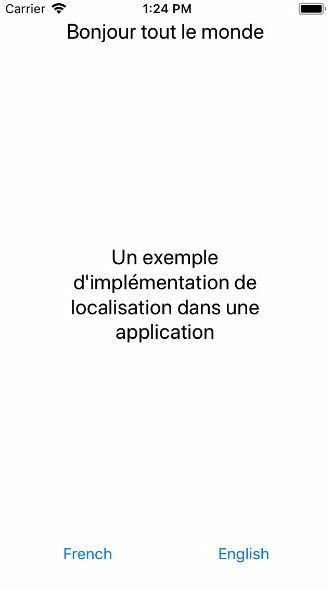 As an example, we’ll translate the phrase “An example of localization implementation in an application.” This will be the value. Now we’ll need to create a unique key, for example EXAMPLE_LOCALIZATION. We add this key to our English file. The same key that contains the translated phrase will go in the file of the target language. Don’t forget about the semicolon! Create an IBOutlet for our Label from storyboards and assign the following function to the IBOutlet text: «NSLocalizedString(«EXAMPLE_LOCALIZATION», comment: «Some example text»)». The first parameter here is a key, the second is a comment. This will make it easier for other team members to find and understand the phrase. Now it’s time to check if everything works. Launch your application. This time, there’s no need to use storyboard translation files, as all translation will be implemented in code. In the second step, you’ll need to untick storyboards when you add a new language and create a Localization.strings file once more. You’ll need to add phrases that require translation in the files in this manner: “key” = “value”. You’ll also need to add @IBOutlet for the phrase “Hello world” in the code and in the localization files with the key. In this example, we’ll store the current language in UserDefault. 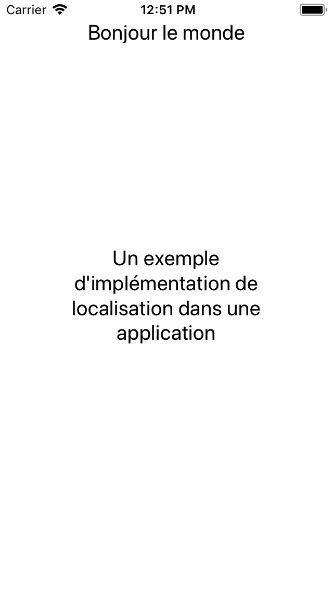 To make things simpler, we’ll create an extension called Localization that will return the necessary translation with the help of a key. We’ll need to write a function to get the language from UserDefault. After that, we’ll be able to address the folder and file containing the translation we need using the bundle. 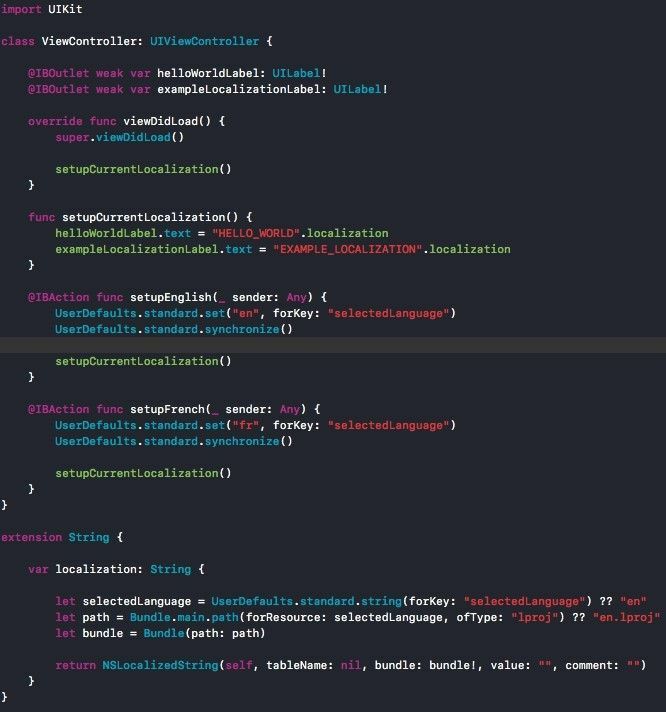 After that, we’ll replace the «NSLocalizedString» construction with a key plus localization attribute and create a separate function, setupCurrentLocalization(), and add it to viewDidLoad. It’s time for testing. Let’s launch our app and see what we get. Ideally, you should implement localization at the end of your multilingual mobile app development process. This needs to be one of the last steps after all UI elements are installed. 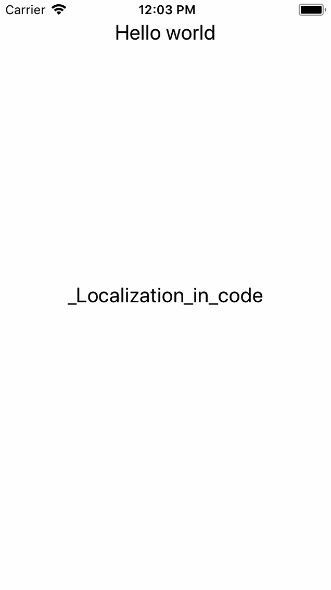 Mark the places that will get the translation from the code and not from the storyboards, for example _Localization_in_code. This will make the translation easier for a new person in your project — they’ll be able to understand, which phrases are translated in storyboards, and which — in code. Moreover, it will help you find bugs. You can use any unique value as a key. 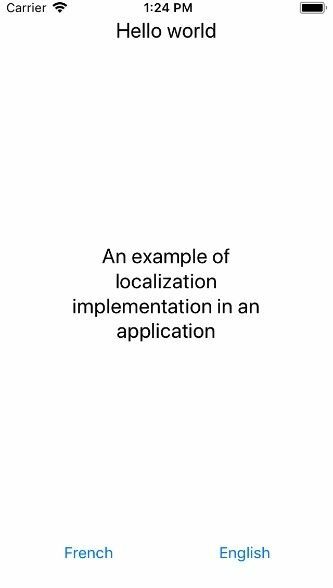 However, in iOS a key usually consists of capital letters and an underscore between words – for example, EXAMPLE_LOCALIZATION. 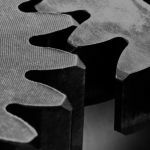 Localization isn’t an overly difficult task, and implementing it is rather easy. However, there are some nuances that can cause problems and bugs if you don’t pay attention to them. 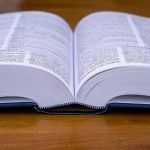 The examples in this article are pretty basic, and there are also other methods and libraries we haven’t mentioned that can make localization easier for you. If you have any questions about how to launch a multilingual mobile app, don’t hesitate to contact Mobindustry for more information.